In the immediate post war period, the British tethered car scene was clearly divided between those who believed that the cars should represent full sized prototypes and those for whom that was a secondary consideration to speed. That is not to say that many of the former were not exceedingly competitive, indeed Gerry Buck with his E Type ERA ‘Topsy’ was the first British car to exceed 100mph. Within a few short years though, scale appearance was sacrificed in the pursuit of speed, resulting in many, long established competitors leaving the sport. One of the most prolific builders of near scale cars during the early years was Carl Wainwright of Leicester. 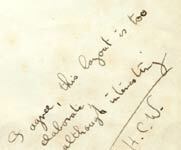 Herbert Carlyle Wainwright was born at the turn of the 20th Century, eventually becoming a highly skilled engineer, almost certainly working at one of the many textile or hosiery manufactures based in Leicester. In just over three years from 1945, he built at least six, near scale, tethered racing cars including in most cases the engines, clutches, transmissions and gearboxes, an impressive output by any standards. Despite regular work related trips to the US and a period of ill health that must have restricted his building time significantly, another three cars at least were built by 1950. Luckily, most of his cars were given differing racing numbers, which has helped us identify them in photos where there is no description or caption. The first car of note was number 7, ‘Black Wasp’, and the only one of his cars that was not really a scale model, as it was more representative of some of the earlier racing cars such as the Delage. The 5cc motor was home built and distinctive in that the drive to the rear axle was by chain. Wainwright, along with Gerry Buck, Ian Moore and many others, had realised that to maintain anything like a scale bonnet line the motors would have to be mounted either horizontally or at a quite acute angle. The chassis followed common practice of the time as well being made from two flanged aluminium side rails with wood fairings added. Wheels and tyres presented a challenge for all the ‘pioneers’ with Wainwright following others in using wooden wheel discs with flanges gripping square rubber strips as tyres. Wainwright’s wife Violet raced ‘Black Wasp’ regularly from 1946, doing consistently well in its class, especially in the numerous handicap events that used to be included in the calendar. 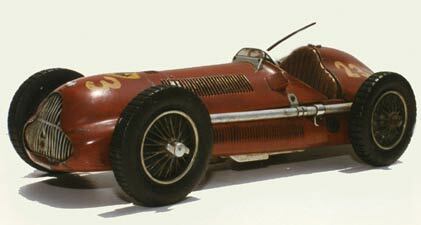 Over the winter of 46/47, Wainwright also built a tiny Mercedes and at least one Alta that appeared in ‘Motor Racing in Miniature’. One of these was on the Drysdale Press stand at the National Model Aircraft Exhibition at Dorland Hall. This car had independent rear suspension and a sprung front gearbox and axle converted from a motorcycle speedo drive unit. A magazine article refers to Wainwright’s close involvement with motor-cycles that may have been the catalyst for the use of the chain drive, a speedo drive as a gearbox, Bowden cables etc. 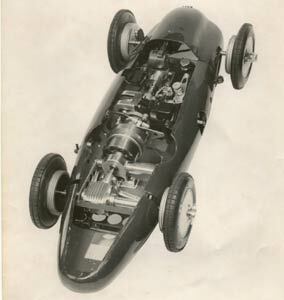 The only other piece of information is that a 6cc ‘Streamline’ motor, which was reputedly built from surplus Dyne parts, powered one of the Alta cars, but it is not the engine shown in the photograph, so could that have been in the second car? There is also mention of a 2.5cc car being built, possibly for their daughter? The Mercedes, which had a 4.5cc motor, seems to have been shared between the two of them until an E type ERA was completed, after which it was run regularly by Violet. ‘Wasp’ was ‘Model of the Month’ in Model Cars in Jan/Feb 1948. 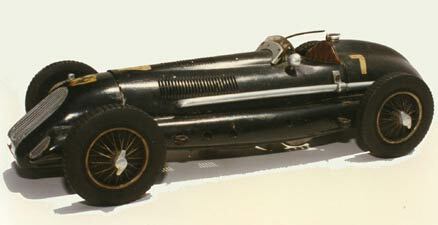 The ERA was the largest of the cars Wainwright built, being over eighteen inches long and wore the number 18. The motor this time was a Gerald Smith Lapwing, again mounted horizontally but in a pan, rather than a chassis. As far as we can trace, this was the first of several cars with the pans and bodies beaten from sheet aluminium, in this case 3/32" or 13SWG for the pan, 16SWG for the body and around 22SWG for the tail fairing. Like other of his cars to follow, the body required holes in the side panels to accommodate the plug and plug lead, although Gerald did produce a version of the Lapwing with plugs in the side of the head. A handwritten note from Wainwright on the back of this photo agrees that "this layout is far too elaborate, but interesting. "The ERA got ‘Model of the Month’ treatment in Jul/Aug 1947, yet reading through this article and comparing the car then and later reveals some discrepancies. The text goes into detail about the correct modelling of the ERAs ‘distinctive’ radiator cowl with divided clover leaf apertures and horizontal slats and quotes the colour as ‘a deep maroon. By the time we see the car next, the opening in the nose is one large orifice with a mesh grille and the paintwork is British racing green, probably accounted for by a reported altercation with a wall as a result of a broken cable. 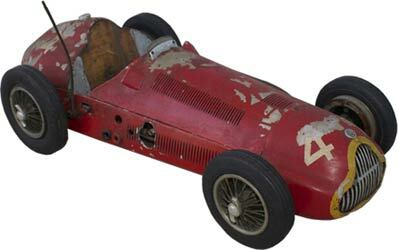 Another superb piece of modelling soon followed, this time an Alfa Romeo 158 Alfette, race number 4. 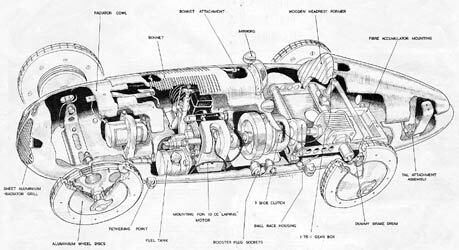 The power unit for this was ingenious and complex with a homebuilt 5cc motor driving one wheel only through a homebuilt clutch and epicyclic gearbox. Ignition was via a MI magneto. The pan was from 14swg aluminium and beaten to shape without any annealing, which must have been quite a job? Wainwright was most insistent on having wheels that looked as realistic as possible, so the Alfette had spoked wheels with rims and faux ribbed brake drums machined as one, shod with Dunlop Fort treaded tyres as used on the M&E models. 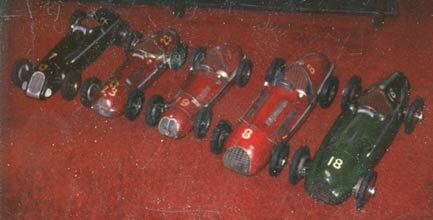 The car won a special award at the 1948 Model Engineering Exhibition. In a report of the Leicester Home Life exhibition in 1951, where the Leicester Minicar Club had a stand, it was mentioned that a Dooling 29 had replaced the homebuilt motor. The epicyclic gearbox had also been dispensed with and replaced by a conventional bevel gearbox both driving rear wheels through a solid axle. The car also won a trophy donated by Lt Col Headly-Briggs at the exhibition. Next up was a 4CLT Maserati, wearing number 19, similar in size and style to the Alfa to the extent that the same formers were used for both cars. Another short cut in producing the car was using a McCoy 29 motor rather than build one from scratch, understandable as this was the sixth or seventh car built in less than four years and was built in ‘a matter of weeks’. The use of the McCoy kept everything within the bodyshell for the first time with the driveline, clutch and gearbox at the extreme left of the car. The wheels are given a different treatment as well, with the fronts being the same as the Alfette, but the rears, hand cut Raylites with spokes added to the outside and drums to the inside. The car held the Leicester 5cc track record, where they ran on an indoor track of just 35ft diameter. The Maserati was featured as ‘Model of the Month’ in April 1950 where the text refers to the next car, a 10cc Ferrari, already running in chassis form and scheduled to be completed within two or three months. When the body and paintwork were finished, this became number 8. Details become very skimpy at this stage as Model Cars, which featured Wainwright’s cars regularly, ceased publication, leaving only occasional mentions in Model Maker and Model Engineer, but from photos we have received the motor looks suspiciously like a Dooling, again with his own fully enclosed contact breaker system. The size of the Dooling allowed the motor to be fully enclosed within the body shell with the plug well clear of the metalwork. The much more powerful engine probably dictated the fitting of ZN wheels and tyres, rather than the spoked type that Carl normally considered so important to the scale aspect of his models. The Dooling motor was probably sourced on one of Carl’s many trips to the US. It is interesting that his earlier voyages to the States were on a succession of well-known liners, including the Queen Mary, but later it was with BOAC and no doubt a Stratocruiser. The last car that we can positively identify from Carl’s workshop was another Alfa Romeo, a larger version of the Alfette, numbered 23. Of this, we can find no details whatsoever, so tracking it down would enable the car to be recorded and a positive ID made of the engines used, which brings us neatly to the crux of the article, What has happened to Carl Wainwright’s cars? The Mercedes came into the possession of a Mr West of Leicester, who advertised it for sale in 1950 for just £10. The Altas are unrecorded and even if they survived would possibly not be recognised. That leaves six cars to be accounted for. A very dog-eared Polaroid (left) of unknown origin shows five of them with the Alfette 4 missing. A later photo purporting to show Carl Wainwright’s car ‘somewhere in Florida’ shows just four of them, this time with the Alfette included but the Maserati and Alfa 23 missing. Eric and Jerry’s magnificent tome ‘Spindizzies’ features ‘Black Wasp’, the ERA, the Alfette 4, Alfa 23 and the Ferrari. Also pictured is the unique engine and single wheel drive unit from the Alfette, not from ‘Wasp’ as captioned. Later photos of the Alfette and the text confirms that it had a McCoy engine fitted, but this looks suspiciously like the complete engine, gearbox and drive train from the Maserati, which has yet to be discovered and would account for all the extra holes in the pan of the Alfette. It also begs the question as to what became of the Dooling 29, unless that was transplanted into another car? It was assumed that the cars that appeared in ‘Spindizzies’ were part of the ‘Spindizzy’ collection in California, so it was with much surprise and amazement that the Alfette appeared on eBay in a very distressed condition. Difficult to believe that any collector would have treated it so badly, and where had it been between appearing in ‘Spindizzies’ in 1998 and it being offered for sale on eBay? Photos from the vendor clearly show a McCoy engine and transmission, so where is the original engine now? It could well be that the other four cars have now been separated and sold or passed on as well? It is sad to us that such an important part of British tethered car history and some of the finest crafted cars to be built in this country have been treated in such a cavalier manner and may now, along with the individual histories, be lost. As a footnote, in spite of featuring the cars on OTW and facebook, no one has come forward with any information as to the whereabouts of any of these cars. Perhaps a ‘Bermuda Triangle’ for tethered cars exists in mainland USA? Right: Black Wasp as last seen nearly 20 years ago. Thanks to Ron Reiter, Justin Cookson and Miles Patience for original images.